Where to Park: Park at the top of Del Webb Drive You will need to drive through the red gate (Please open/close the gate at the bottom of Del Webb as you arrive or leave) all the way up the mountain and park before you pass the yellow gate on top. (top of “2K Trail). Everyone, please park on the same side of the road. 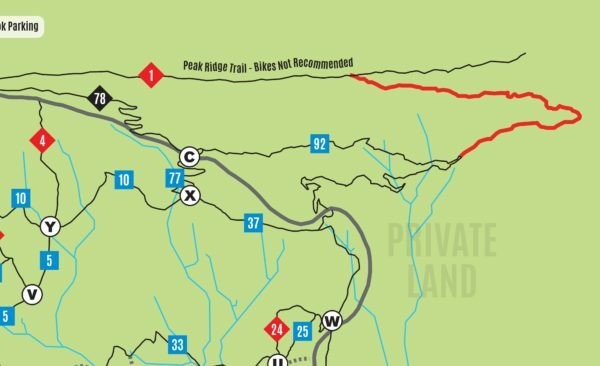 See online map with the new trail. What to Bring: You, good working attire, and a friend! Your Bicycle Coalition will provide tools and beverages for post-trail work enjoyment. Goal: 1200 hours in the next 26 weeks, 15 volunteers a week! 2017 Project will begin with finishing up the trail at the pond so it goes completely around the pond. In 2017 we will also be working on continuing trail “VA54” so it connects the the “Boundry Trail”. The gate by the Horse stalls will also be open for folks to drive to the Pond. Feel free to ride your bike in as well. SVBC will supply tools and drinks. Bring gloves and good trail work attire. For more info on trail work days contact Thomas Jenkins: tj (at) shenandoahbicycle (dot) com, 540-236-2001. Thomas Jenkins and Rich Edwards estimate that, beginning in 1996, SVBC members have spent 15,000 hours building trail on the Western Slope, and that perhaps 500 sets of hands have shaped those trails. And more is to come! COMING SOON: MORE HISTORY OF SVBC at MASSANUTTEN! Members of SVBC have been volunteering hours to help maintain and build trails on the Massanutten Western Slope for the past decade. For inspiration, check out the videos below to see what the trail work below has accomplished.